NEW YORK – April 24, 2018 – TravelClick, a leading global provider of data and revenue-generating solutions for hoteliers, today released new data from the Company’s April 2018 North American Hospitality Review (NAHR). 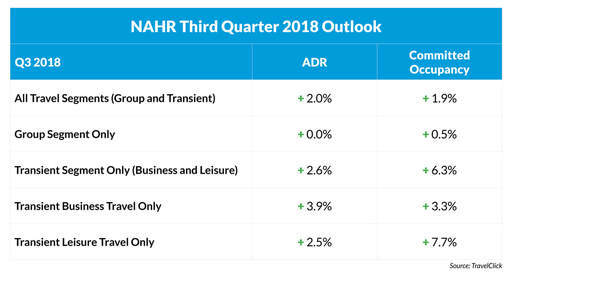 According to this data, North American hoteliers are experiencing continued growth in the second quarter of 2018, with bookings up 2.7 percent and average daily rates (ADR) up 2.5 percent across all travel segments. Driving much of this growth is group travel, up 7.5 percent in bookings, 3.8 percent in ADR and 11.6 percent in revenue per available room (RevPAR). Additionally, RevPAR for all travel segments is up an impressive 5.3 percent. For the next 12 months (April 2018 – March 2019), transient bookings are up 2.1 percent year-over-year, and ADR for this segment is up 2.2 percent. 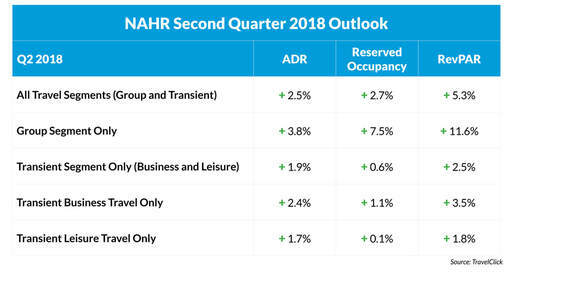 When broken down further, the transient leisure (discount, qualified and wholesale) segment is up 2.3 percent in bookings, and ADR is up 2.1 percent. Additionally, the transient business (negotiated and retail) segment is up 1.4 percent in bookings, and ADR is up 2.6 percent. Lastly, group bookings are up 1.2 percent in committed room nights* over the same time last year, and ADR is up 3.1 percent. The April NAHR looks at group sales commitments and individual reservations in the 25 major North American markets for hotel stays that are booked by April 1, 2018, from the period of April 2018 – March 2019. The second quarter is based on forward-looking data (April – June 2018). TravelClick offers innovative, cloud-based and data-driven solutions for hotels around the globe to maximize revenue. TravelClick enables over 50,000 hoteliers to drive better business decisions and know, acquire, convert and retain guests. The Company’s interconnected suite of solutions includes Business Intelligence, Reservations & Booking Engine, Media, Web & Video and Guest Management. As a trusted hotel partner with more than 30 years of industry experience, TravelClick operates in 176 countries, with local experts in 39 countries and 14 offices in New York, Atlanta, Barcelona, Bucharest, Chicago, Dubai, Hong Kong, Melbourne, Myrtle Beach, Orlando, Ottawa, Paris, Shanghai and Singapore. The Company also provides its hotel customers with access to a global network of over 600 travel-focused partners. Follow TravelClick on Facebook, Twitter and LinkedIn.